You may think this is me again but I sincerely don't think so. This picture shows my taste for Fantasy characters such as this "dwarf" or something. 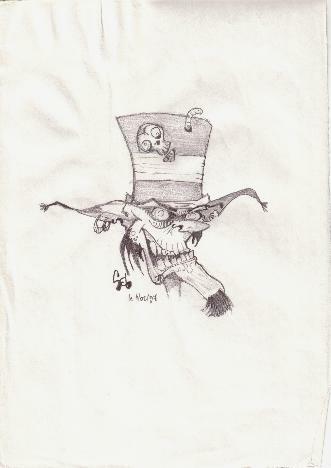 I guess I just let my fingers trace it, starting with the sneaky eyes, bony jaws, half rotten ears then and so on... Of course it's far from finished but I really think it looks nice and stylish with his funny hat (I'm a Beetlejuice fan too). You can observe that I often exagerate proportions (jaws, chin for instance) and I think it adds dynamism to this picture that could be taken for my own definition of a Leprechaun (a legendary Irish dwarf with magical powers and a questionable sense of humour).